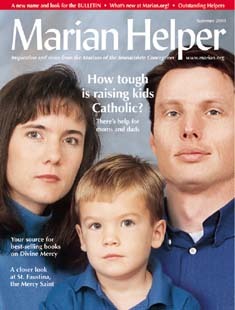 How tough is raising kids Catholic? Trade in your misery for Jesus' mercy. Throughout her life, St. Maria Faustina grew in intimacy with the Merciful Savior by giving Him her misery on an ever deeper level. The nature of her intimate and warm relationship with Jesus is compelling. Time and again, she records in her Diary how the Lord immersed her in the fount of His mercy, and she snuggled close to His compassionate Heart. She describes herself being "plunged into an ocean of love" (Diary of St. Maria Faustina, 513) and resting on the Lord's Heart (Diary, 801, 929, 1348). But we tend to forget the misery part of the equation. Saint Faustina had to struggle with giving her misery to the Lord and trusting more in Him. And as she did, the Lord increased her capacity to receive His endless stream of mercy. She began to enter into a deeper relationship with Him as He revealed her calling -- to be the great Apostle and Secretary of His mercy. In fact, if we read the "Diary" carefully, we discover that some 120 times St. Faustina writes of misery and then typically describes how she plunges into the infinite ocean of Divine Mercy with greater trust. She becomes ever more aware that the abyss of her misery is filled by the ocean of God's mercy. Her difficulties start early in religious life -- during her years of formation in 1927-28. We see her overwhelmed by misery and crying out for God's mercy, as she experiences a spiritual dark night. She doubts her vocation and even wonders if her prayer is displeasing to God. "I could find nothing but great misery," she writes in her "Diary" about this time. "I could also clearly see the great holiness of God. I did not dare to raise my eyes to Him, but reduced myself to dust under His feet and begged for mercy" (23). Even in this interior darkness, Sr. Faustina perseveres by doing her duties and grows in trust. She tells the Lord, "In spite of everything, Jesus, I trust in You in the face of every interior sentiment which sets itself against hope" (Diary, 24). So, too, the Lord calls us to persevere in our duties and trust in Him, even when we are going through great difficulty and pain. Instead of interior darkness, we may face the loss of a loved one, our own failing health, or a serious financial setback. Whatever the difficulty, Our Lord will remain faithful to us as we persevere in our duties and trust in Him for a resolution to our problem. Like many of us, Sr. Faustina experienced misery and suffering in a number of her relationships. On several occasions, she even faced persecution at the hands of her fellow sisters. One incident, which probably occurs at her congregation's house on Zytnia Street in Warsaw, is particularly instructive for her. She reports that one of the "older Mothers" of the house had summoned her. "It was as if fiery bolts from the blue were coming down upon my head, so much so that I could not discover what it was all about," she writes. "But, after a while I understood that it was about a matter over which I had no control whatsoever." The older religious summed up her complaint by telling Sr. Faustina, "Get it out of your head, Sister, that the Lord Jesus might be communing in such an intimate way with such a miserable bundle of imperfections as you! Bear in mind that it is only with holy souls that the Lord Jesus communes in this way!" Sister Faustina responds by acknowledging her wretchedness and adds, "But still I trust in God's mercy." Jesus then tells her, "Be at peace, My daughter; it is precisely through such misery that I want to show the power of My mercy" (Diary, 133). How many times have each of us experienced such misery in our relationships? A spouse or a child may be distant or incommunicative just when we need support the most. Or we may feel that a close friend or coworker has misunderstood us after we have opened up and shared from the heart. As we work through our hurt, can we say like St. Faustina did, "But I still trust in God's mercy"? Even in the last year of St. Faustina's life, the Lord revealed to her a very powerful insight on our human misery. In prayer, Sr. Faustina is thanking the Lord for His many graces to her. She tells Him that she has given her entire self to Him and now has nothing more to give. But Jesus calls her up short, "My daughter, you have not offered Me that which is really yours." She probes herself deeply and cannot determine what it is. So, she asks the Lord, "Jesus, tell me what it is." Jesus then tells her with compassion, "Daughter, give Me your misery, because it is your exclusive property." She now records, "At that moment, a ray of light illumined my soul, and I saw the whole abyss of my misery. In that same moment, I nestled close to the Most Sacred Heart of Jesus with so much trust that even if I had the sins of all the damned weighing on my conscience, I would not have doubted God's mercy; but with a heart crushed to dust, I would have thrown myself into the abyss of Your mercy" (Diary, 1318). What a picture of misery! "Even if I had the sins of all the damned weighing on my conscience." And what a picture of total trust in God's mercy! "I would have thrown myself into the abyss of Your mercy." And the outcome is a deeper intimacy with the Lord as she nestles close to the Heart of Jesus with all that trust. What about each of us -- do we give the Lord our misery, which is our exclusive property? Or do we hold on to our hurts, our sufferings, our sin -- in a word, our misery? Bring your misery to the Lord right now. Decide to start every day by turning over your misery to Him. Make a point of owning and then offering Jesus your misery when you participate at Holy Mass, go to confession, or adore Him in the Most Blessed Sacrament. If Holy Mass and adoration are not available to you, you can make repeated "spiritual communions" by simply stopping for a moment (15 seconds to 1 minute) and offering up to the Lord, who is present in your heart, any misery that you are carrying. Then thank Him briefly for His love and mercy. If we make a habit of giving all of our misery to the Lord every day, we will discover an intimacy that we never thought possible. Like the Mercy Saint, we will find ourselves becoming more immersed in His mercy and snuggling closer to His merciful Heart. Fr. George W. Kosicki, CSB, is one of the best-known authors and speakers on Divine Mercy. His new book "Meet Saint Faustina" (EBKMSF, $9.99) can be ordered from the Marian Helpers. See ordering information on page 16. ©2001 Marians of the Immaculate Conception. All rights reserved.